Los Pelicanos is particularly suitable for couples, who love tranquility! Casa Para Ti "Los Pelícanos" is located in Puerto del Carmen in a small quiet residential community. A true oasis to relax in the busier resort, only 5 minutes walk to the beach. Just book and we'll take care of you! We offer you a carefree holiday. We'll meet at the airport, guide you and bring you to the apartment. For your convenience, the fridge will be stocked with fresh local products for breakfast, so you can enjoy a long lazy morning or have an early start to visit our magical island. You will enjoy this spacious ground floor apartment due to its central location, everything is within walking distance, and for the comfortable and cozy furnishings. Los Pelicanos is particularly suitable for couples and business travelers, who are looking for tranquility, relaxation and a carefree vacation! It's "a true haven" to relax at the pool in the lovely landscaped garden. We offer you a personalized welcome and gladly advise you about what to visit, where to eat, … so you'll have a great holiday at our magical island. Parking is always available in the quiet street near the residence. the fridge will be stocked with fresh local products for breakfast. The tennis court is just around the corner. Thank you Leonardo and Nadia for letting us use your lovely apartment ,we had a great time and will return . Your apartment was very clean and had everything we wished for Thank You both for looking after us so well ,and Thanks for the chocolate for my birthday kind regards Diane and Martin. It was really a pleasure to have you in our home. You took very good care of the apartment. Hope to see you soon. Modern furniture,spotlessly clean,it was like being at home. It was so relaxing we could of easily stopped another week. You will find all the facilities you need to cook and the tv had loads of sports,movies,music channels. Leonardo was a great host and also picked us up and dropped us off at the airport. Thank you Mark and Michelle. It is always a joy to host guests who respect that much what we offer. A true haven is correct! A very special oasis in Puerto del Carmen. Fantastic apartment. This is a wonderful property perfect for two people. 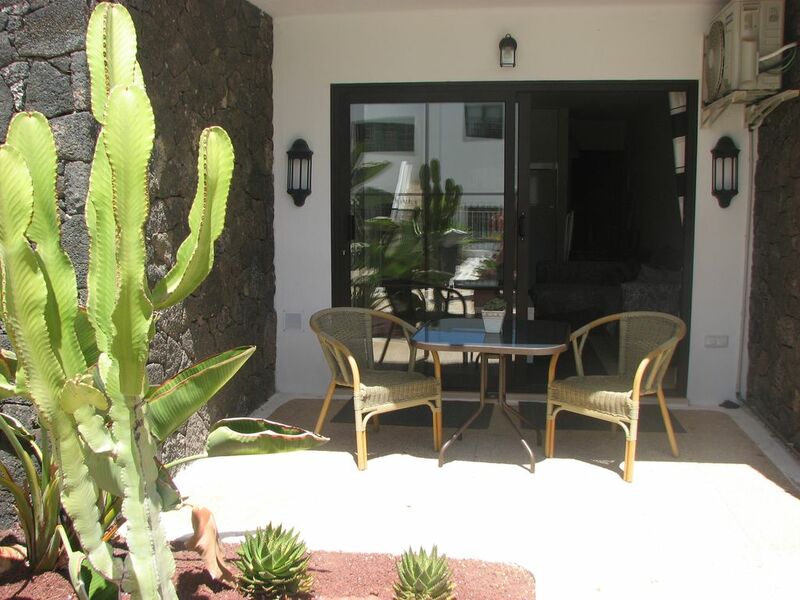 Great location between the old and new town of Puerto del Carmen. Easy walking distance to beach, restaurants, supermarkets and shopping centres. Leonardo is a very gracious and attentive host. Pick up and drop back to airport a great touch and a well stocked fridge a welcome sight for breakfast on our first morning which we had on the sunny private terrace. Highly recommend! Lovely Apartment.. Home away from home, with everything you could need an more. The apartment is as the owners described, well presented, comfortable and well equipped. Leonardo and Nadia are lovely people, nothing is ever too much trouble... thank you for looking after us. Would highly recommend and will definitely return. Thank you Nova, we hope to see you again. Thank you so much. The problem of the washing machine is solved. We installed a new one.